In the latest of our Learning ITIL Poster series we’ll explain how the 4 Ps of Service are vital to any planning strategy. The 4 Ps are the four forms of strategy that should be present whenever a strategy is defined. A service provider’s perspective and position will allow it to develop plans that, if executed, using patterns of repeatable actions will ensure that the service provider achieves its strategic objectives. 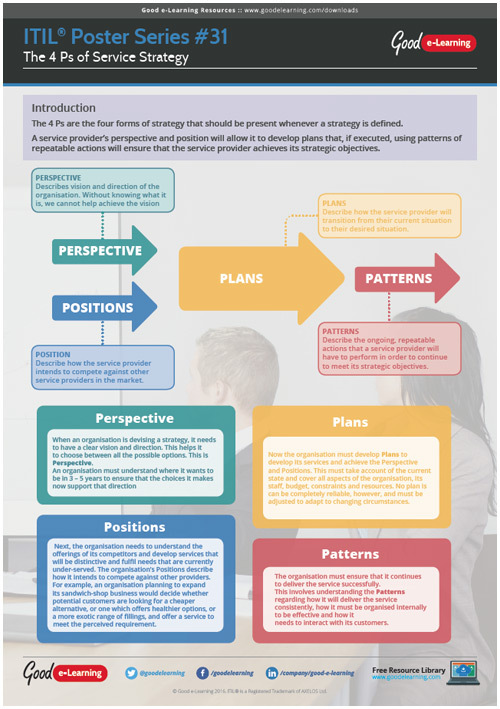 Download this Learning ITIL poster today to learn how the 4Ps of Service Strategy can benefit you and your organization!